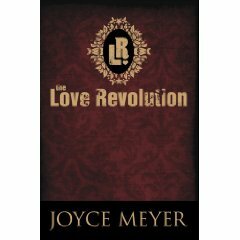 Joyce Meyer has written over 80 books and "The Love Revolution" is one of her finest offerings. In this book she declares war on selfishness and encourages Christians to join her in what she calls a "Love Revolution." Like many others (myself included) she used to question God and ask Him why he would allow such unimaginable suffering to occur in our world. What she finally realized is that if the two billion Christians in the world joined this revolution we could end poverty and alleviate suffering in a matter of weeks. This is a powerful message, which calls all Christians to action. "The Love Revolution" contains amazing stories of how God's love is shown through willing participants who have dedicated their time, resources and energy to making the world a better place. I was at first shocked by some of the statistics and to be honest part of this book made me feel angry. Yet it was a good anger that should lead me to doing more instead of less. Joyce Meyer weaves together Bible verses, personal experiences and encouraging ideas that inspire the reader to think about their life more seriously. Her purpose is to make each of us ask: "What did I do today to make the world a better place?" In this end this book is a powerful wake-up call which will encourage the reader to long to participate in the healing of the world. I've never read a book that so urgently calls the reader to action. By reading "The Love Revolution" you will become part of the solution and hopefully if enough people take this seriously we could really see change in our lifetime. If you want to do something today I'd encourage you to go to www.worldvision.org, which is a wonderful site that promotes healing in the world. As humans, we all seem to be on a journey to becoming more loving spiritual beings. Some people have learned to become more loving by first controlling their thought life. 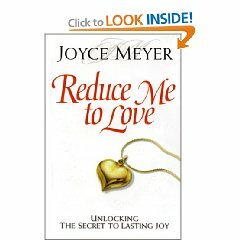 Joyce Meyer's is one of those people and in her book "Reduce Me to Love" she explains how she achieved more peace, joy and satisfaction in life after she learned that love is not just a feeling it is also an action. In order to be more like Christ she encourages the reader to show patience and forgive and forget (as God does). She also explains when it is appropriate to show preference to others and when it is basically a sin to discriminate against people. By reading this book you can see if you are living up to your potential. Are you really as loving as you seem to appear to be or could you improve your relationship with God by becoming a much more loving soul? This book will challenge you and maybe even make you feel that you are doing a lot of the right things. Depending on where you are in your journey this book can appear to be a commendation or a reprimand. Either way you will learn something new and come away with a fresh perspective. Like all the other Joyce Meyer's books I've read this one really speaks to the heart.